The World’s Best Sushi Chef? A documentary that goes behind the counter and into the life of a man who’s been called the greatest sushi chef in the world is set to open in New York Friday. Tucked away in an underground Tokyo subway station is an unremarkable-looking 10-seat eatery called Sukiyabashi Jiro which serves Michelin-starred sushi by 85-year-old Jiro Ono, the first chef in Japan to earn three Michelin stars. 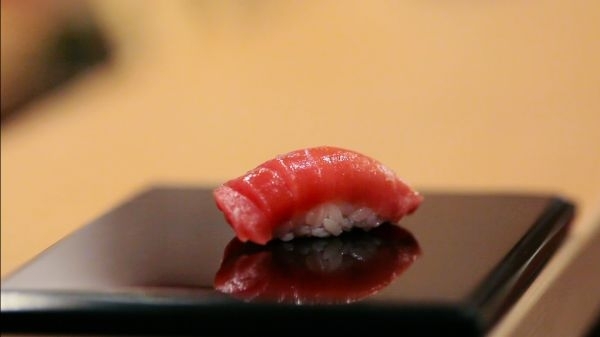 In trailers for the film Jiro Dreams of Sushi, filmmaker David Gelb captures the deft, economic movements of Ono’s hands as he shapes and molds the rice for his sushi and lacquers the fish with gentle brushstrokes. Sushi and sashimi are presented on black marbles slabs and diners eat in a hushed silence that speaks of their reverence for the ceremonial experience and the master sushi chef. The film is not just an ode to sushi and the octogenarian’s unrelenting pursuit of perfection, but also explores the father-son relationship and succession as the eldest son Yoshikazu is slated to take over the legendary restaurant.